What Could Make Speaker Alvarez NOT Sponsor Robredo's Impeachment Complaint? 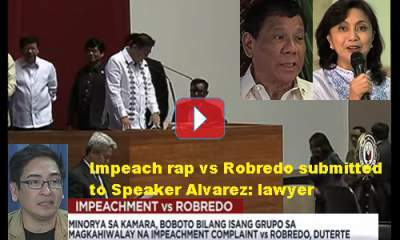 What Could Make Speaker Alvarez NOT Sponsor Robredo’s Impeachment Complaint? Speaker Pantaleon Alvarez was too eager to sponsor Leni Robredo’s impeachment complaint earlier – but it died down after the president and other lawmakers said that it’s a waste of time. However, the impeachment complaint is already at Speaker Alvarez’s office. He vowed to study it. [VIDEO]: Maging ang minorya sa Kamara, pag-aaralan na ang impeachment laban sa Pangalawang Pangulo. Lawyer Bruce Rivera of the “Impeach Leni movement” clarifies that it was Alvarez he refers to as their endorser. He earlier hinted saying that a male lawmaker is “studying” the case that triggers confusion. They added that the group has the solon’s “commitment.” But it’s not clear if he commits to study or endorse the impeachment complaint. Alvarez has yet to decide on their request. Their complaint states that Robredo commits betrayal of public trust when she criticizes the killings in the administration’s drug war with the wrong data. Alvarez also thinks that Robredo’s video to the United Nations Commission on Narcotic Drugs is “very irresponsible and stupid of her.” This certainly could hamper the country’s economy and tourism – which should not be done by any government officials. The complaint also states Robredo’s misdeclarations in her Statement of Assets, Liabilities, and Net Worth. She allegedly misused Pag-IBIG funds when she was chairman of the Housing and Urban Development Coordinating Council. These were denied by her camp. Although Alvarez maintains his willingness to support the impeachment as of this time of writing, Bongbong Marcos’ supporters are not excited with this move. It can only bring confusion to the VP succession protocol. They want the electoral protest to speed up so that the recount can be processed. This way, the real winner for the Vice Presidency can, at last, be proclaimed. Since this is a free country, the speaker can very well make a choice to give lawmakers more tasks to do or trust the Supreme Court for the fair and just process of Marcos’ election protest against Robredo. Either way, she’s out – and if that’s all that matters for Alvarez, then he might as well respect the wishes of his colleagues and the president.